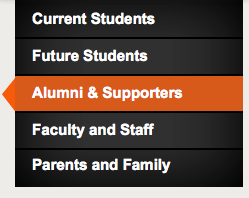 Version 1.2.4 of the OSU Home Page rolled out quietly, so to speak. If you received a text, phone call or email of the emergency notification test, then you have signed up to receive alert notifications for Oregon State University. If you haven’t, then you should visit the alerts page and sign up. If you happened to be looking at the home page when the alerts went out, something else happened. You would have seen a red area and text about the alert that appeared due to the code changes we made for the home page in our 1.2.4 release. The work that started with the 1.2.0 release continued and we were able to rollout and actually do a live test of the functionality necessary to have both alerts manually pushed to the page by a person’s intervention, as well as an alert to show up without human intervention. You read that correctly, no human intervention. How does that happen you ask? Well, through OSU’s usage of the Blackboard Connect system to distribute alerts, we were able to leverage the alert RSS feed that was set up as part of the notification process. By developing code to watch for new feeds, and also with feeds being able to have start and stop times, we can not only place them on the home page with no intervention, we can also remove them as well. Now what happens if something goes wrong with the automatic process you ask? Well as stated, we do have that capability for human intervention to put alerts directly to the home page. Also, in some cases, alert information or updates may not go through the emergency alert notification system, so the human intervention was a necessary requirement. In going through this process, we did learn a few things that we will be making enhancements and improvements in the next few maintenance releases. So here’s to you OSU Home Page, and to the collaborative efforts of many on campus, the Crisis Communications Team, Kirsten in Network Engineering (who I am giving a personal thanks), Central Web Services and Web Communications, for being on alert! Central Web Services and University Relations and Marketing Web Communications Team, in partnership, is pleased to announce Version 1.2.0 of the OSU Homepage has been released on the evening of December 22nd. The main feature that this release brings is the ability for inclusion of an alerts region to prominently display alerts, whether it is from the Emergency Response Alerts, or to other alert aspects, such as University closures due to inclement weather. The full list of items performed in this release are highlighted below. What’s Next? We’ll be performing some close out tasks on Version 1.2.0, and then per our Home Page Release Schedule (at the bottom of this note), we’ll be starting the next cycle. Feature input for the next cycle, version 1.3.0 is open, from now through January 15, 2011. Please note: Any minor fixes will continue to be performed in maintenance releases, such as 1.2.1 or 1.2.2, etc, between minor/major release cycles. Emergency & Alerts Functions: These functions allow for displaying alerts prominently on the main oregonstate.edu page, and allowing for University Relations and Marketing management of alerts to the main page. In the event of high traffic, there is the availability to create a light version of the home page, that does not bring in the numerous images from the full home page, but allows for alerts to be displayed. In addition, this release allows for sharing of the alerts data for the mobile platform, at m.oregonstate.edu to be able to receive alerts. Other Features: Allow for individual site campaign settings in the Make a Gift link in the top hat that is included on other sites. Bug fixes: As with all software, ours is no different. Every piece of software has bugs, so we continue to look for and fix bugs in every release. Code Improvements: Code improvements are based on re-architecting code to improve re-use, performance, readability, and usability. When we first went on this journey of recreating the home page this past year, I set forward a strategy to look at the home page like any other piece of software that is developed by those big commercial companies, ie. to bring it into a software development life cycle. As part of the software development life cycle, we have released several versions to date, including many small dot releases, those 1.0.1 and 1.1.1 type of releases. Without the notion of a software development life cycle, it is hard to plan in a software development organization. For all the other Universities that don’t do this, I would have you consider taking the same approach. So now on to the next set of items that we can bring to the home page. We look forward to hearing any ideas, so please share your ideas. * Major versions may be substituted with minor versions if no major feature release is included. These dates are when feature input for the upcoming releases are cut-off to proceed to release management of the next release. Well, as we promised before, we are continuing to work on Accessibility fixes for the Homepage. Version 1.1.1 and version 1.1.2 were rolled out today, containing a number of fixes that we weren’t able to get done in time for version 1.1.0. For those who find these numbers strange, I say to you, don’t worry, this is standard software lingo. If software waited for everything to be perfect, then nothing would be released, as evidenced by numerous fixes that are applied to your desktops, laptops, or newer versions of applications you may use. How did we get to the versions, you ask? A while ago, we asked ourselves the question, why isn’t the Homepage done in the same manner other software development is done? After all, it is ultimately software. There really wasn’t a good answer to not do it, and by doing this we ensure continued focus, not just on how pages look, but also on how pages sound, how pages flow, and how pages are read. So back to 1.1.1 and 1.1.2. In examining the home page, in partnership with the good people in Disability Access Services, we found that when putting the home page through a screen reader like JAWS and a Mac’s own VoiceOver software (Apple’s screen access technology), not all of it made sense. We needed better announcements for sections, more descriptions around what something was or in some cases wasn’t. As an example of the latter, we had the little dots for the feature stories with an alt tag (which is a descriptive tag of the item) of a space, which literally read “space” in going through VoiceOver. Does this mean we are done? By no means. We will be looking at Accessibility on a continued basis, and welcome feedback. While our group handles the programmatic side, there are some decisions that have to be weighted on the messaging side, and all of this has to happen in a method that we are able to meet the needs for those with accessibility needs, and not least of all, to ensure a better browsing experience for all. What’s next for the Homepage? Well, now we are getting into the details of planning 1.2.0, and examining possibilities, options, and those things that just must be done. When? 1.2.0 is slated for a December release. Access Services have been hard at work on this release. Originally slated for release on September 1st, there were some delays as the new features introduced some interesting bugs. You may not notice it if you don’t look closely. 2. Another important function that went into this release is the “sticky” nature of the main content area. For those wondering what the main content area is, it is the area (including the menu) after the feature stories. Menu pictured here. Now if you click on a menu, go to any of the links off the menu, and hit the back arrow, or back function of your browser, where before it would always take you back to Future Students, now it will remember where you were. In order for this to function, cookies will have to be enabled for your browser. As long as browser cookies are not cleared, it should remember for 30 days. Why 30 days? Well the initial reasoning is that if there are changes to the Future Students content area, we want everyone to know, so as ambassadors of Oregon State University, the word can be spread to everyone you know. Now the 30 days isn’t an absolute, so we are interested in hearing from people if the 30 days needs to be longer, or even shorter. 3. The next function we are introducing is the ability for Multimedia content in the Feature Stories. You will now be able to play some video and audio content from the home page. 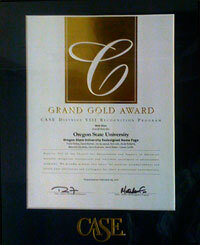 You will see a multimedia area that indicates the type of multimedia (video pictured here). If you see that and click it, it will open a box and you can stream the video to your computer right there, without leaving the OSU Homepage. Now if you don’t see any Multimedia link, it likely means that there isn’t video or audio tied to a feature story. 4. Now what I consider as some of the most important changes, many of you won’t see. We have put a stronger focus on Accessibility, working in conjunction with Disability Access Services to look at how accessible the homepage is for people with disabilities. For those who don’t know much about this topic, I would encourage you to find out more. We still have a list of additional fixes that are still being worked on for Accessibility. The key here to note is that the focus on Accessibility is not just a one time event. In the coming weeks, we will look to roll out more Accessibility fixes in version 1.1.1, and keep going in version 1.1.2 and further until we can get the Homepage among the best in the country for Accessibility. With dynamic content and dynamic functionality, it is not always the easiest to accomplish. Our goal is to look for those solutions that will help accomplish it. So that’s it, there may be a few small bug fixes as well that you won’t have to worry about. We’ll be next planning version 1.2.0 for release in December, where we will look to have additional features and functionality. For those planning to be at University Day, we’ll be unveiling something new for OSU! So come on by to University Day and visit both Web Communications and Media Services/Central Web Services.